My daughter’s been sick to her stomach since yesterday morning. Every couple of hours, she runs to the bathroom and is ill. The odd part is that every single Halloween of her life, she has been sick in some way or another. It’s usually a cold, though. Last year, she was just a little under the weather, so we took her out anyway, but I’m not seeing it in the cards this year unless she makes a dramatic improvement. It’s very sad to be five years old and sick on Halloween. Also, I keep almost nodding off, no matter where I am or what I’m doing, because of course I’m up with her. Knitting just makes me nod off faster. Thank goodness I don’t have a wedding tonight. Poor, poor sick little girl, and poor poor Mommy and Daddy. I’d recently seen patterns for keyhole scarves that I thought were kind of interesting. Basically, you make a small hole in one side of the scarf to thread the other side through, tying it without having to have a knot. All the ones I saw were for novelty yarns, though, and I really wanted to knit something big and bulky and warm. A teeny little hole wasn’t going to admit a bulky yarn. So I decided to make a slit going lengthwise instead of a short hole widthwise, and did the whole scarf in seed stitch for a more interesting, bumpy texture. And, voila! It works very well, and seems to go nicely either in front or over the shoulder. 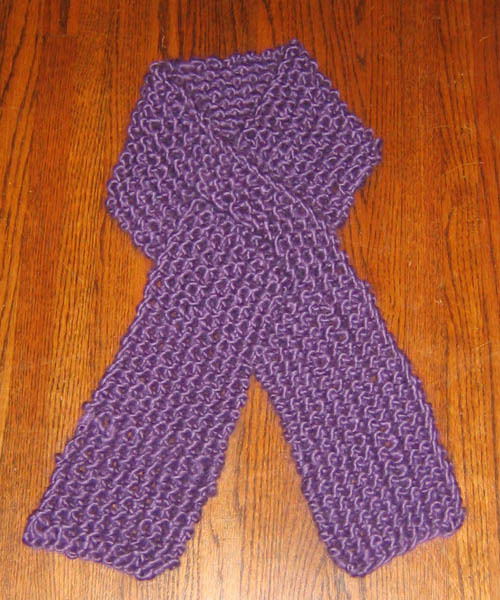 The yarn is Plymouth Yukon, a blend of wool, mohair, and acrylic. Very cushiony feeling. 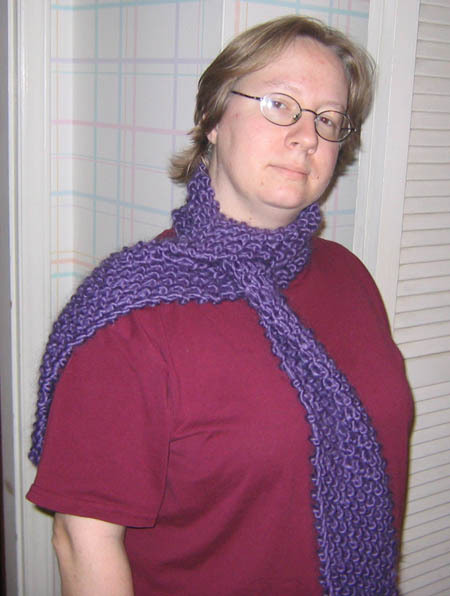 I’m pondering knitting a shorter version of this in pink, as it remind me of the breast cancer ribbons one sees about. All in all, I’m pleased. I can’t believe that I mailed the devil hat on Monday and it got there by this afternoon, but lo and behold! It did! Here’s a pic of the little devil wearing it. Looks like it’s a little too big, but his mom says he really likes it – and that it’s very appropriate. This boy is a big switch from his three older sisters. Apparently his current thing is playing in the toilet. The kid’s a menace. If you haven’t already heard about Donors Choose then let me fill you in. We all know that public school budgets are a joke. Donors Choose is a site where teachers can submit directly to a central organization for things which they need which aren’t covered under their budget. These can be things that you wouldn’t think they’d have to do without (pencil sharpeners), or things which can help inspire their classroom (bubbles – I gave to this one today), or relatively inexpensive things that can help expand the students’ horizons (optical mice). You can choose to give as little as ten dollars toward the overall cost of a project, and the contribution is tax-deductible. If the project you put your money towards isn’t completely funded within four months, you’re given the option of putting your money toward another project and helping someone else. The nice things about this is that you know *exactly* where your money is going. I know I find it gratifying to think of, for example, a child being rewarded for good classroom behavior with a book I helped buy. Even if you choose not to give, I hope you’ll still go browse, as it’s quite enlightening just to see what teachers need and are having to do without. It can open your eyes to the need for greater funding for schools. Cotton roll sweater part 3! 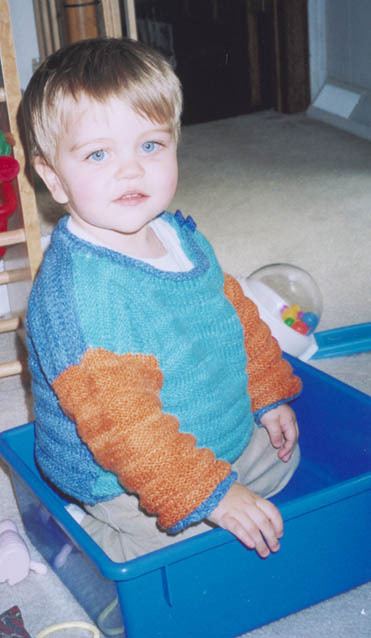 I know I just can’t shut up about this sweater, but I finally got a picture of the little boy wearing it. Also a report that he wore it to church on Sunday to many oohs and aahs. For my nephew, just in time for Halloween. 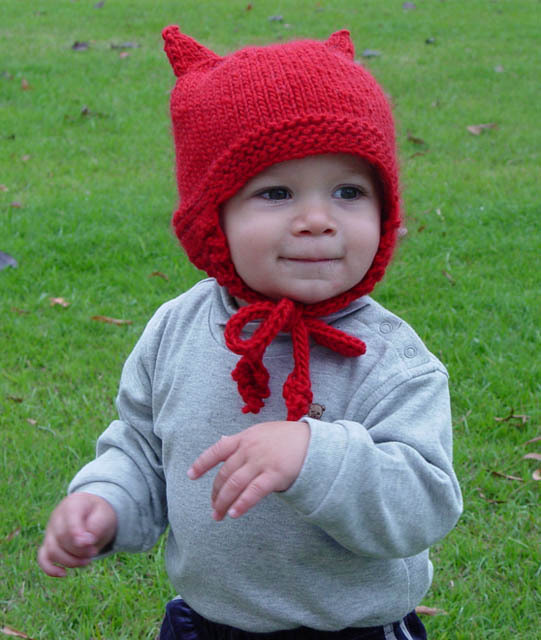 Believe me, he’s already got the ‘little devil’ attitude thing going, the hat is just the topper. Behind the scenes of a crash! If you play DR and were wondering what the GMs were doing during the crash, check out SGM Riel’s LJ. change what matters to them. Very true! Fight the power! When I visited with Ceosanna and Tessima in Maryland in August, Tessima very kindly bought a ball of yarn and told me to make something for my daughter with it. And so I have! She wouldn’t stop jamming pizza into her maw long enough to pose with it, but she does like it. Knitters, it’s pretty simple. On #11’s, I cast on 48, purled, knit, purled, decreased to 24, purled, decreased to 12, knit in stockinette for a long time, then at the other end increased to 24, purled, increased to 48, purled, and bound off. 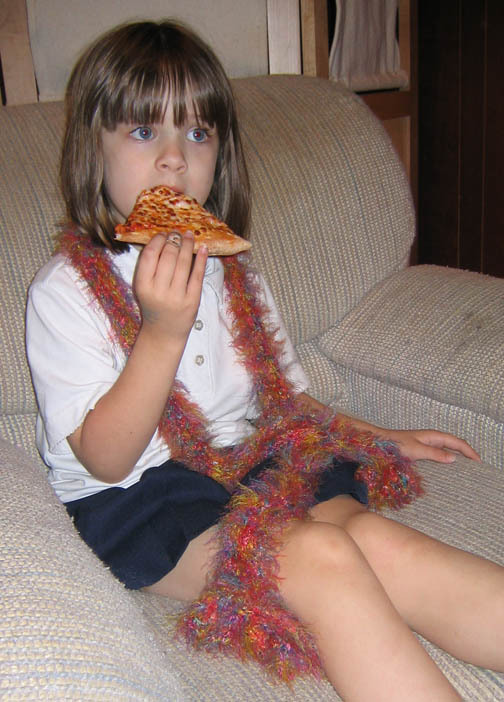 My daughter knows who got the yarn, and, in her own way, is grateful. Thank you, Tessima! Cribbed from reexy and bubba. I don’t know why, but I feel vaguely offended at the results.